I sold a K-55 Radar to a man, Steve Patterson, whose dad designed the original K-55. I asked him to tell "The Rest of the Story!" My son, Steve, gave me a copy of his correspondence with you concerning the K55 radar. I'd be happy to give you what history I know on police radar. I first became familiar with police radar in the mid 60's when I was working with a local consultant named Fred Berry. Fred had designed the Dominator radar for Jack Fritzland, which was later sold to some company in New Jersey, as I recall. Fred Berry was also designing Guitar amplifiers for Buddy Ross at Kustom Electronics in Chanute Kansas. After Jack's no compete expired, it was decided that Kustom would enter the police field, since Jack knew the ropes of that field. Kustom Signal was then formed and headed by Jack Fritzland, Later Ed Sergent and Ken McCoy would be hired for the sales dept. Kustom was having enormous success with their guitar amp and music products. Fred Berry suggested to Buddy Ross that he hire me to head a newly formed R&D dept., here in the Kansas City area. So in January of 1969, I became full time at Kustom R&D. Buddy Ross wanted Fred to work full time, too, but Fred had more fun in his consulting practice. By the end of 69, partially due to personal changes and other things, I left Kustom to design medical products for a small local company. By the early 70's though, Jack Fritzland had left Kustom and decided to start another company! The new company was CMI and Jack had the vision of a hand held unit. Jack contracted me to do the analog and power supply work and Gene Lundy to design the package. Soon, McCoy and Sergent were on board to run the sale of the "SpeedGun" Gene Lundy gave it the name and obviously it has become generic. The first SpeedGun was a poor performer, though, as the antenna was totally contained in the unit. At Ed Sergents insistence, the antenna was extended beyond the end and it worked well enough to sell. Jack Fritzland was an enthusiastic skier and soon moved the company to Minturn Colorado (near Vail) Ed and Ken had the sales operation in Chanute, and I had new products and final assembly in Lee's Summit. By the end of 74. Jack Fritzland decided to close the Chanute operation and move everything to Minturn. 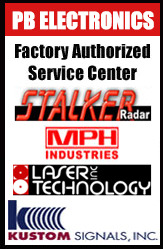 With that decision, having been made, Ed, Ken and myself decided it was time for another radar company! I went back to designing medical products by day and radar at night! At last, I had a product to myself! Just me and non technical salesmen! So I decided to do what's seldom done, that was to design something that could be easily serviced and upgraded! It took the entire year of 1974 working part time to do the K55. as soon as it was finished, we had an order for 450 units! I had to scramble to assemble a manufacturing operation! so in 1500 square feet, shared with my metal supplier, we produced the first 5000 K55's! as luck would have it, they worked well and we had few problems...Soon every tech was telling us how great the K55 was to service and maintain! Everything was really great till Kustom decided to sue us for patent infringement! as you probably well know, there is little in common with the Kustom radar and the K55, even so having to fight this was a big blow to us. Later the big trials by the detector people in Florida and New jersey led to the Federal radar specs by NHTSA. The announcement of this paralyzed radar sales and to make matters worse, the Communications workers were trying to organize MPH! My partners decided to close the Lee's Summit operation and move everything to Chanute (does this sound familiar?) with that, I sold my 1/3'd to Ed and Ken and started Progress Instruments at the end of 82. In 83 I incorporated and begin producing DC motor speed controls agricultural salt spreaders, tennis ball machines and golf caddies, A couple of years ago, I retired and turned the business over to my son, who has now multiplied it by over ten times! It was good to see another K55 and the last time I knew, MPD was still making it after 27.. years! Serviceability did make a difference in product life! I have to go now, don't hesitate to ask me anything, I'm retired and just mostly free. Please feel free to use this story any way you like. There is really a lot more detail but it's probably not pertinent to the big picture. When we formed MPH I wanted to call it Xecar (Seek car), but McCoy and Sergent quickly squelched that (bad) idea and suggested MPH ! I agreed quickly and had my old friend, Jose Conde, from my Vendo days, design the MPH logo, which, as far as I know, is still in use. Some of the ideas for the K55 came from my experience in designing telephone EKG equipment for transmitting heart EKG's to specialists This was done with a 1300 Hz signal FM'd +/- 250 Hz....It worked well, till the phone line became noisy so I added a phase locked loop filter that worked so well that it would record when the signals were barely audible at all ! Naturally, when the K55 was rolling over in my mind, it became apparent that phase locked loops would play a major part. As it turned out, phase locked loops provided both the verification (validly) and was the basis for the tracking filter! The tracking filter alone was responsible for a 13 db signal to noise improvement. The original choice of op amps turned out to be a problem, so comparators and better op amps with smaller offsets resolved that issue. Another goal of the K55 was to have real time subtraction. As it turned out this solved any perceived problem of closing speed and own speed not occurring , (ugh). Again, the double edge subtractor turned out to be the simplest solution, as well. The subtractor and the tracking filter was an original design. The verification phase locked loop is straight out of the RCA handbook. The fixed active filters underwent improvement as op amps and techniques improved. By the time MPH went into business, several manufactures had Gunn oscillators. We used them all at one time or another. It seemed that no one could produce a good consistent unit, so we hopped from one to another. I decided to see if we could build our own oscillator, so I contracted John Brassfield to do this, The Brassfield oscillator worked well, was small and low noise and had $8.00 in parts as opposed to a $34-$40 GE or Microwave Associates package. Getting consistent mixer diodes was always a problem, too. We'd go for months with no problems, then they would all go sour and the manufactures would just shrug! An interesting sideline, early on, was GE's insistence on testing my voltage regulator before guaranteeing their oscillators. The PNP low drop out regulator was original, too. That same circuit is used in my buddy's cap tester and monitor test pattern generator, today. A slight mod on the circuit made it an electronic circuit breaker, protecting it from shorts and overloads. I sure could have used a cap tester when I was doing medical equipment. Early small electrolytics were not what they are today...One piece of medical equipment that we sold would be inspected for the presence of Cornell Dublier electrolytics, if any were present, they were replaced! the failure was almost always in ESR, not capacitance...I did have a problem with some IT&T tantalum caps that would explode! There were all red, and we advised that any red "bomb" be replaced.